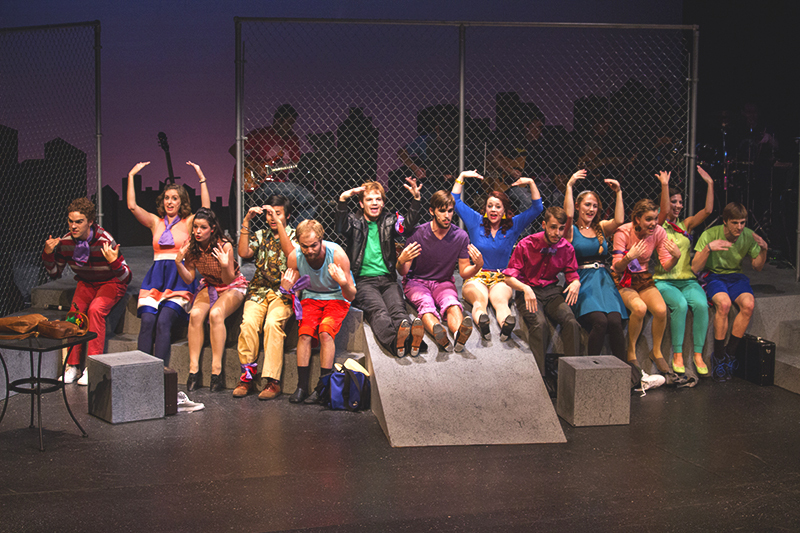 The 2015 fall MainStage, “Godspell,” opened last weekend. Performances will continue this Saturday and Sunday afternoon. Thirteen GC theater and music students are performing this fall in “Godspell,” a musical that brings the narrative of Jesus to life through song and dance. Jacob Zehr, a sophomore music education major who played the leading role of Jesus, enjoyed building relationships with the rest of the cast, his 12 disciples, as well as the crew throughout the rehearsal and performance process. Other cast members included Ben Ganger, a senior, in the roles of John the Baptist and Judas, and seniors Paul Zehr and Christina Hofer, juniors Maggie Weaver, Galed Krisjayanta, Sadie Gustafson-Zook and Morgan Short, sophomores Emily Evans and Simon Weaver, and first-years Naomi Peters, and Lukas Thompson; all of whom are playing disciples. Doug Liechty Caskey, professor of theater, collaborated with Scott Hochstetler, assistant professor of music, to direct this show. 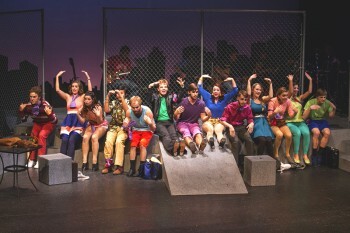 Together, they chose to put on the 2012 Revised Version of the 1970s musical, which is filled with updated references to pop culture. In one such reference, Simon Weaver, a sophomore biochemistry major, played the rich man in one of Jesus’ parables, weaving in recent quotes from billionaire Donald Trump, whose name was written into the 2012 revision before anyone knew he was going to run for president. “Playing Donald Trump is one my favorite parts of the show, because it makes everyone laugh and it’s ironically relevant to the political scene right now” said Weaver. Other modifications of the show included an attempt at balanced usage of gendered pronouns, which was noted in the program. For copyright reasons, song lyrics were left unaltered, but pronouns in spoken dialogue were revised. Also onstage was a live band, made up of Christine Larson Seitz on piano, Dustin Lowe, Andrew Sellers, and Rodolfo Gonzalez Roa on guitar, GC first-year Garrett Flowers on bass guitar, and Jeff Cooper on percussion. Dancing for this show was choreographed by Maggie Weaver, a junior interdisciplinary major. As part of the choreography, Weaver taught fellow cast members how to tap dance. The lighting design was created by junior Riley Woods, who has been involved in various theatrical productions in the past year. After Woods designed the lighting, he trained first year Aiden Friesen to operate the light board. Friesen was one of 43 individuals who made up the show’s production team. This team, combined with cast, has been working since the beginning of the semester, with nearly daily rehearsals. According to Emily Evans, a sophomore ASL major, all the time spent was worth it. “While the community we’re building on stage is all part of the show, it ended up being genuine off stage as well,” she said. Performances of “Godspell” began last weekend, and will continue this coming Saturday and Sunday, November 21 and 22, at 8 p.m. and 3 p.m. respectively. Tickets can be purchased in the Welcome Center, online, or at Umble Center prior to the show.